A gathering force of Melbourne designers and fashion intellects are diligently creating the opposite to fast fashion. They are creating slow fashion, fashioning in the concept of sustainable clothing. This year, Melbourne Spring Fashion Week emphasised ethical and sustainable fashion production and design more than ever. 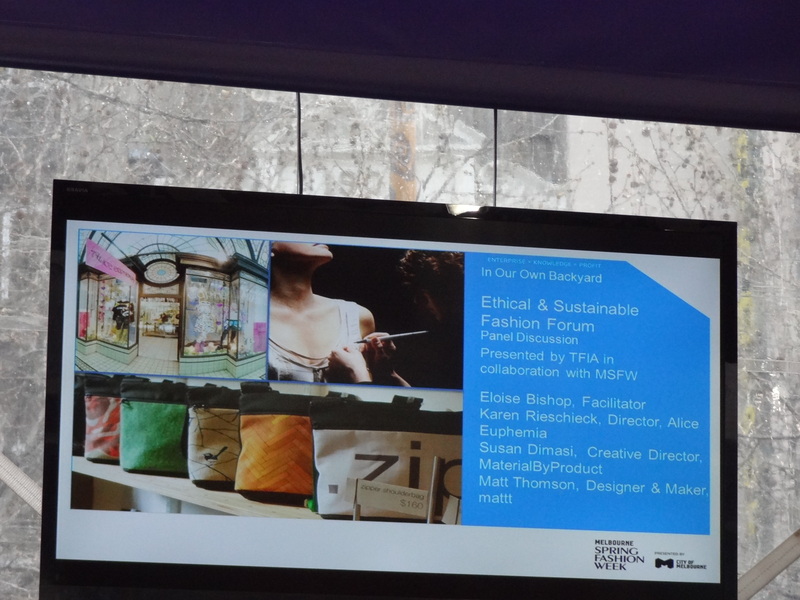 In collaboration with Textiles and Fashion Industry Australia, MSFW held sustainable fashion seminar and display, “In Our Own Backyard.” It demonstrates the strong focus that Melbourne’s fashion industry is putting on quality and lasting fashion – all which will reduce our carbon footprint. The environmental impact of mass produced clothes is beginning to hit home too. Although Australia’s sustainable product market is worth $26 billion, as individuals, we still produce 30 to 40kg of textile waste per year. 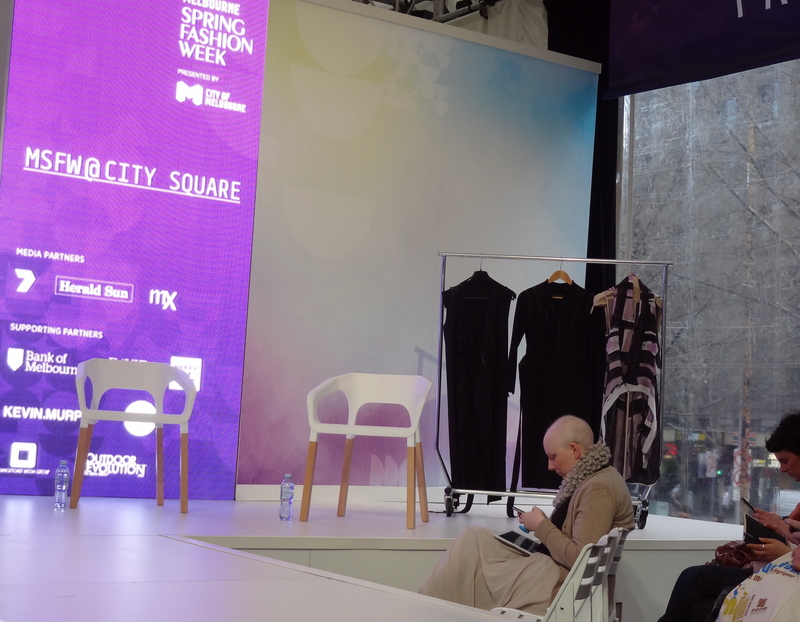 To overcome this, Mayor Doyle states that Melbourne will open itself to more sustainable clothing production. A display of sustainably and ethically made garments was on show at the “In Our Own Backyard” seminar. From a designing and branding point of view, Bishop believes that producing sustainably creates a “differentiated and innovative brand.” And one designer, whose sustainable design techniques have created just that, is Materialbyproduct designer, Susan Dimasi. With a deep appreciation for simplicity, she constructs her garments solely with high quality materials, including silk, wool and leather. Dimasi’s process is almost poetic. Her pleating follows the human form, aiming for ease of movement and to finish the piece, hand-stitching and silk binding are employed. See http://www.melbournereview.com.au/read/391/ for more information on Dimasi’s process. Unhurried and deeply customized products are why slow fashion is gaining demand. Creating investment pieces, in our economic hard times many consumers are shifting from disposable and novelty fast fashion to ethical fashion. The personalization that slow fashion allows is also what makes Matt Thomson’s handmade bag label, Mattt, truly unique. Thomson designs compact, light and durable bags. Their simple shapes mean less waste and the high quality and local materials used create a lifetime guarantee. Packaging is also recyclable and biodegradable. Repairs and alterations are other sustainable fashion avenues and ones that Karen Rieschieck, owner of high clothing store, Alice Euphemia, wants to educate consumers on. Albeit an old fashion concept, up cycling or repairing of clothes can extend a garment’s life, reduce textile wastage and make wardrobes more individual. Consumers can also be sustainably fashion forward by purchasing from local designers and stores who produce onshore. Local production and design increases material and quality control and reduces the environmental impacts of international transport and shipping. Dimasi and Reischieck talking sustainable fashion. Overall then, sustainable clothing must be fashioned past being a trend itself, to simply and unquestionably being apart of how we style ourselves. For more information on Alice Euphemia see http://www.broadsheet.com.au/melbourne/fashion/directory/shop/alice-euphemia. To see more on Matt Thomson’s bags see http://www.mattt.com.au/. And to learn about the lifecycle and environmental impact of clothes go to http://www.melbournereview.com.au/read/202/.